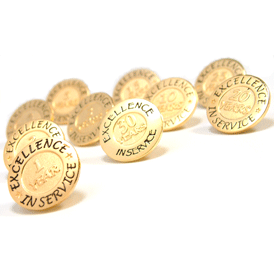 A great way to give recognition to employees for their "Excellence In Service." Stock service pins are made from our Die Struck Two Tone process; High quality gold finish with a sandblasted background. SVP pins available in YEAR(S): 1-15, 20, 25, 30, 35, & 40.